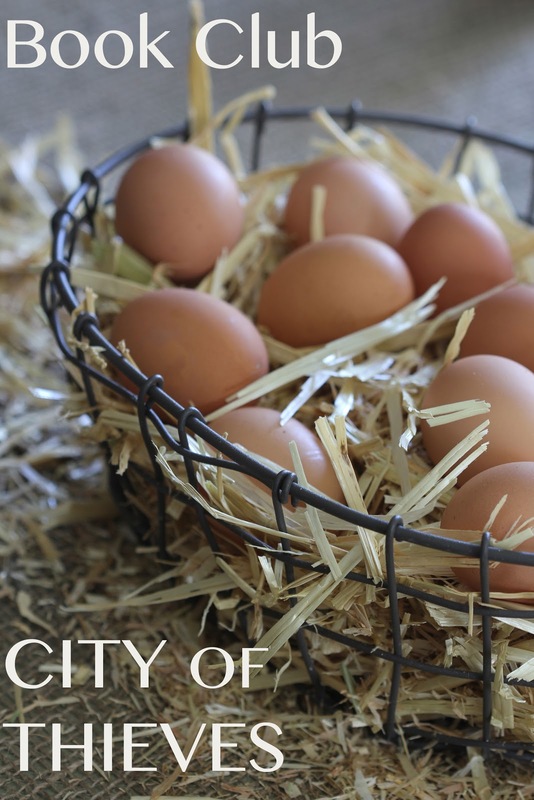 We originally selected The End of Your Life Book Club by Will Schwalbe for our April Book Club, but after a flurry of emails mid-month we decided to switch to City of Thieves: A Novel by David Benioff. While we had great hopes for our first selection, none of us could really get into the book and felt, since the last two months had not been stellar, we needed a page turner. The Darien Library hosted an evening with David Benioff last night and, since many of us enjoy going to hear from the author in person, it seemed like a perfect choice for us to switch to. I, sadly, did not get to go hear him speak, because I really loved his book and wish I had been there. Did you go? If so, leave a comment with how it went and what he was like.. I am so bummed not to be there. 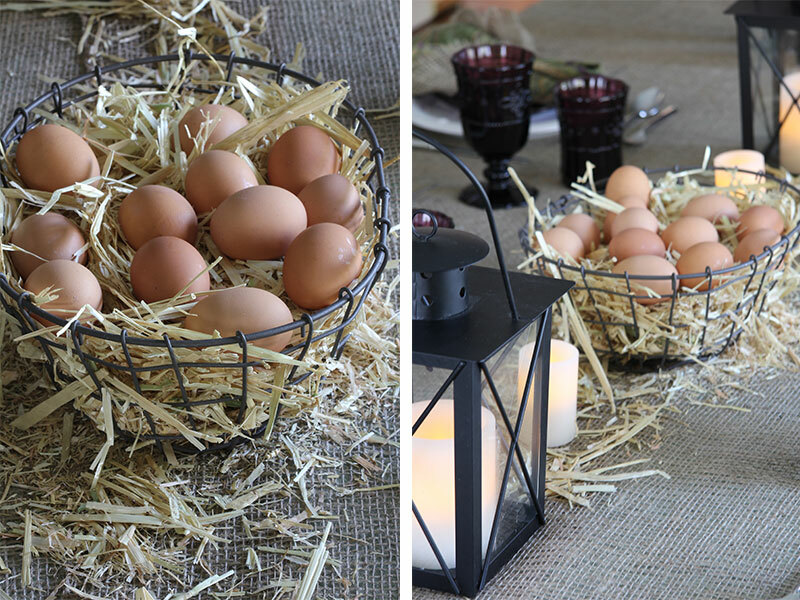 To create my tablescape I used a roll of natural Burlap, a decorative bale of straw and a dozen brown eggs (yes, fresh eggs!) total cost about $20. I used a green tablecloth with the burlap as an overlay. The burlap was long enough to cut two lengths to cover the table with an overhang and make twelve three inch napkin ties (we were only 8 but now I have extra!) 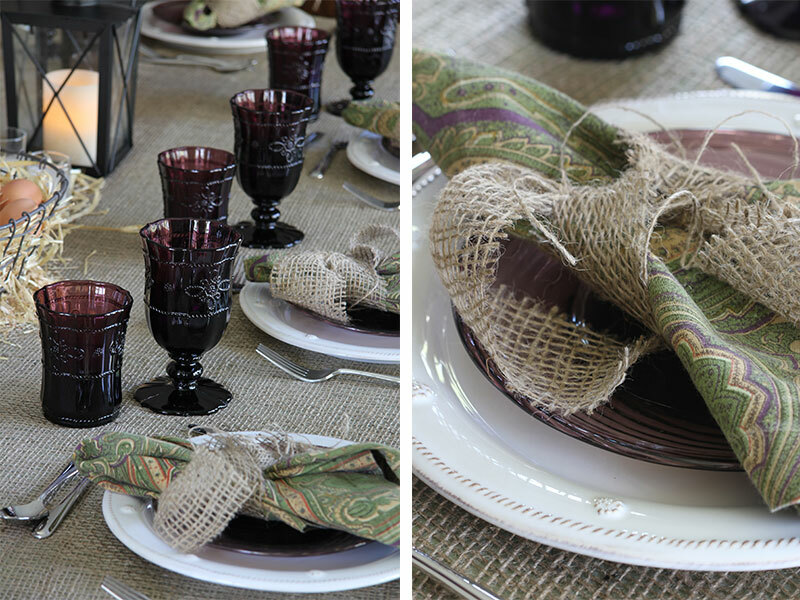 I used my Hand Pressed Glass footed goblets and highballs with the Berry & Thread Dinner Plate. I thought it came out like a rustic Russian setting that were enhanced with lighting from lanterns and votives around the room. After a little slump, I am now back to reading and can’t wait to get to next months book! Happy Reading and if you have any great book suggestions please leave a comment. I would love to hear from you. THank you for this! will go now and order. I’ve been looking at my Wish List on Amazon, my Pinterest boards, my Evernote notes and couldn’t really come up with anything outstanding. I’m flying (again) to Paris and Provence the end of May and am already looking and planning my reading and movies!